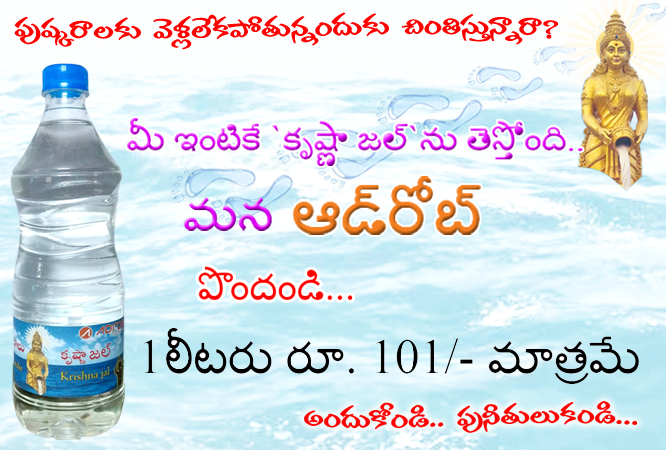 Adrobe.in, Hyderabad based ecommerce company, is going to home deliver the holy Krishna Pushkaralu water , which is Branded as “Krishna Jal” in Hyderabad during 13th to 23rd of this month. Walk for Water, an NGO which is working to save water on earth, is supporting the initiative by offering the technology to purify the Krishna Water using Reverse Osmosis (RO) and bottling the holy water. Consumers can now directly book the 'Krishna Jal' on www.adrobe.in website or make a call to 040-40044442/40028738. 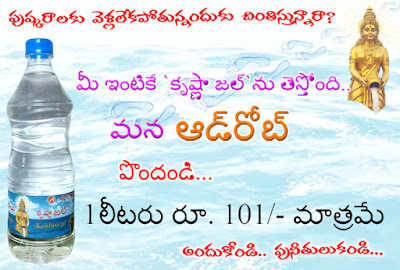 The consumers of Hyderabad those who cannot personally go to Pushkarulu can utilise this service by booking the holy water online packed in 1 liter pet bottle. Branded as 'Krishna Jal', the holy water is also available for the people of other cities of India including Telangana and Andhra Pradesh. Adrobe brings for the first time a service of door pickup of Krishna 'Pushkara Deepam' package for the people who wish to offer Harathi and Deepam on Krishna river waters during the Pushkaralu. Adrobe is the brand name of Hyderabad-based Adrobe Networks Private Limited, India’s first ad-commerce Company. It operates as a hyperlocal online marketplace that supports local offline retailers to promote and sell their best products/services to the city consumers. Adrobe assures the same day delivery service to the consumers of Hyderabad who buy anything on its portal. Consumers can buy groceries to gadgets, electronics to fashion and also get the services of electricians, plumbers, painters etc. Online movie tickets will be available very soon on this site. Walk for Water is an NGO Set up with the sole aim of bringing clean water to one and all. Clean Water is a necessity that has been declared as one of the Rights by Supreme Court of India. It is very hard to find clean water, let alone get access to it. Walk for Water not only looks at smarter water treatment plants as a business idea but also considers it a sacred social duty to be performed, addressing the 11th hour urgent need of providing safe water, affordable water and sanitation needs to all the public of this country. That’s why Walk for Water is a CSR Arm of Smaat India Private Limited.